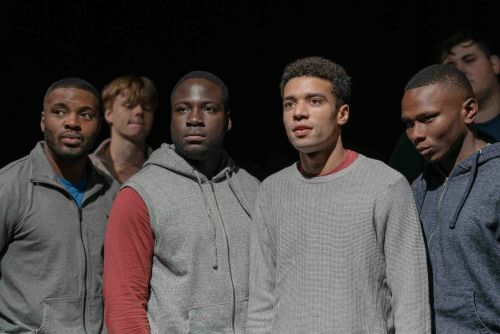 Kwame Kwei-Armah’s first season as Young Vic Artistic Director is now hitting its stride. Beginning with a musical Twelfth Night, that may not have been to everyone’s taste, it certainly emphasised The Young Vic’s passion for community and diversity in every aspect of production and performance. Since that inaugural show, The Convert garnered rave reviews as did Jesus Hopped The ‘A’ Train which is still playing to deserved acclaim in the main house. But, in the small space upstairs shorter runs of experimental, in-development and community-led one-act plays are also a notable part of the programme, not least Luke Barnes’s The Jumper Factory developed with the inmates of HMP Wandsworth. Prison and theatre have a long history and there are countless full-length plays set in various parts of the criminal justice system from classic courtroom plays including Twelve Angry Men and Witness for the Prosecution to more recent smaller-scale works that look at the root causes of young male disillusion that leads to cycles of antisocial behaviour and violence, charted so well in Barrie Keeffe’s Barbarians which premiered at the Young Vic in 2015. Yet, the plays that focus on the containment and strictures of prison life often give the strongest sense of a system so broken that the purpose to punish or rehabilitate remains unclear, including Esther Freud’s Stitchers which had it’s first outing at the Jermyn Street Theatre last June and Stephen Adly Guirgis’s Jesus Hopped the ‘A’ Train. Barnes’s play starts by breaking the fourth wall, the actors step forward and make it clear that what we are about to see was created inside Wandsworth prison by its incarcerated men, that the stories, incidences and experiences relayed belong to people who are still there serving their time. For 45-minutes the audience may be gripped, stimulated and entertained but this remains the everyday experience of all the men who contributed to the show, and it slightly changes our mindset to have this made clear at the start. Before The Jumper Factory settles into story-telling mode, the actors also share their own brushes with the law either through a minor conviction for chasing a fox, a prison-guard brother or friends they have visited inside. Decisively, they insist in unison, that none of them have ever been to prison, that they are just actors assuming the words of other men. It’s a smart opening section, one that instantly frames the viewer’s perspective, encouraging them to look beyond the surface to the grounded reality for the inmates of Wandsworth, a reminder that this is not escapist drama but the recreation of real events in theatrical form. It immediately instils a purposeful reconstruction / documentary-feel to what follows with a clear understanding that the six actors are ciphers for the personalities, complexity, humour and poignancy that prison-life engenders. Barnes uses a single unnamed character to represent the experiences of so many, a man who leaves behind a girlfriend and two children, as well as a mother he refuses to admit the truth to. “The Jumper Factory” becomes the euphemism for his time in prison, an excuse for not visiting his home for a year, for only making brief calls at set times and, in a particularly effective visiting room scene, the lie he tells his young stepson for not seeing him anymore. Perhaps surprisingly, they all accept it, a hint that maintaining the pretence of family life and the unsullied opinion of his loved-ones is essential to the prisoner’s sense of pride. With the lead character played simultaneously by all six actors, the show uses individual monologues, dramatised scenes and some choreographed full-group sections to relay different aspects of prison life. There is a universality about these experiences that is aided by different actors playing the Prisoner throughout while also emphasising that the backgrounds, ethnicity and nationality of the men who created the play with Barnes are also quite varied. None of their crimes, including that of our representative protagonist, are ever revealed, a deliberate move to ensure we see only their humanity and not the crime and record of behaviour that anonymously defines their existence in the legal system. Told in a loose chronological order, The Jumper Factory begins with the Prisoner waiting to be arrested, sitting on a couch in his living room, knowing they are coming for him. Rushand Chambers vividly describes his surroundings, a sense of dread looming while the first panicked thoughts about fleeing breakthrough. Yet, Chambers shows the Prisoner pull himself back, convince himself that a life of on the run would be only too brief and giving himself up is the only way. We skip forward to the first day, imprisoned with an older man who tries to support him, aware how lucky he is to be there instead of with the various groups and gangs he soon observes on his wing. A panorama of prison life follows; we hear about skinny newcomers bulking-up with steroids and hefty gym sessions after joining some of the more dangerous gangs; we are told about the men who’ve lost all hope of getting-out permanently turn to drugs and violence to release their pent-up aggression; we hear the hissing fury of the landing when everyone’s hour of freedom is rescinded for a misdemeanour including cell fires and ripped-out sinks, and we see in crouching, clutching physical form as the 23-hour a day containment grinds them down. Most revealing are all the human stories of hope that run through the play, which Barnes uses well to counterbalance the danger and frustrations of incarceration. In a section performed by the collective actors, different coping strategies are revealed which for the men hoping never to return includes anything from reading novels – Pierre Moullier playing the Prisoner is given a James Patterson thriller by his cellmate – to trusting in God to studying A-levels in order to get a job on the outside. Giving structure to prison life, creating routines, having things to look forward to, counting the minutes to the next period of exercise or web development class all help to control the expanse of time in much the same way that men in combat structure their fears hour-by-hour. Hope also resides in family life and recreated scenes with girlfriend Kai become a core motivation for the ailing Prisoner – a brief rhythmic section chants the days between visits, with 1 instantly resetting to 14 again, an endless cycle of anticipation. It is only inside that he really understands and comes to rely on his feeling for her and their children, the paranoia and fear of abandonment plaguing him in the time between visits, worrying about lives being lived without him, that he will be forgotten. This darkens the mood between them in person too as he looks for signs of commitment and trust. Barnes balances the changes in tone really effectively, often obscuring the light moments with a sudden twist into the more unpleasant sides of prison life, some of which the Prisoner experiences later in the piece. It is impressive that such a brief play is able to provide such a vast perspective on life in Wandsworth, collating a lot of testimony while maintaining a strong sense of character throughout, a man who wants to be good, to get through it by keeping his head down but struggling to retain his balance against the overwhelming pressure and loneliness he experiences all the time. Sometimes he’s funny and buoyant, looking for the brightness as Tej Obano’s sections do, while often these moments become quite affecting including a tearful speech performed by Moullier and a significant confessional moment from Raphael Akuwudike. The Jumper Factory is simply presented by director Josh Parr, the actors in a line facing the audience with each stepping forward with their chair to deliver a speech. But there is considerable variation too, Lighting Designer Jess Glaisher’s creates a central square box for several of the monologues, replicated around all of the actors for the group sections (which also include Ayomide Adegun and Jake Mills), each one a small, individual cell restricting their movements. Sound Designer Mike Winship has cut together interview snippets from the real men behind the play, sparingly peppered through the show, as reality continues to lurk just beneath the surface – the recorded sounds of piano and song a memorable interjection from the people really living this life. With Jesus Hopped the ‘A’ Train gripping theatregoers in the Young Vic main house with its fascinating discussions about masculinity, faith, justice and the price of redemption, adding an extra 45-minutes to your trip to see this small but hugely powerful one-act show is highly recommended before it embarks on a brief tour later in the month. Created as part of the Young Vic’s ‘Taking Part’ initiative The Jumper Factory has so much to say about the what happens after the crime has been committed and the punishment determined. It’s a heartfelt plea to be remembered and understood by the men counting the seconds until their next milestone, whether that’s their parole date or just dinner time. Barnes, you feel, is not done with this play and beyond its visit to the Bristol Old Vic it certainly deserves a longer stretch – the men of Wandsworth will be pinning their hopes on it too.